Most people infected with Zika never show symptoms. But the virus sometimes causes severe disability — from microcephaly in babies to weakness or partial paralysis in adults — and there is no treatment. In a recent study in the journal Molecular & Cellular Proteomics, researchers report a comprehensive study of how the virus interacts with host cells. One of their findings offers insight into how Zika escapes immune signaling and proliferates inside the body. Like most viruses, Zika accomplishes a lot with only a few tools. It has just one protein coding gene, which produces a single polypeptide that's cleaved into 10 smaller proteins — a number dwarfed by the estimated 20,000 protein-coding genes in a human cell. Nevertheless, Zika can take over the vastly more complex human cell, repurposing it into a virus factory. Brian Raught, a researcher at the University of Toronto, said he found that process fascinating. 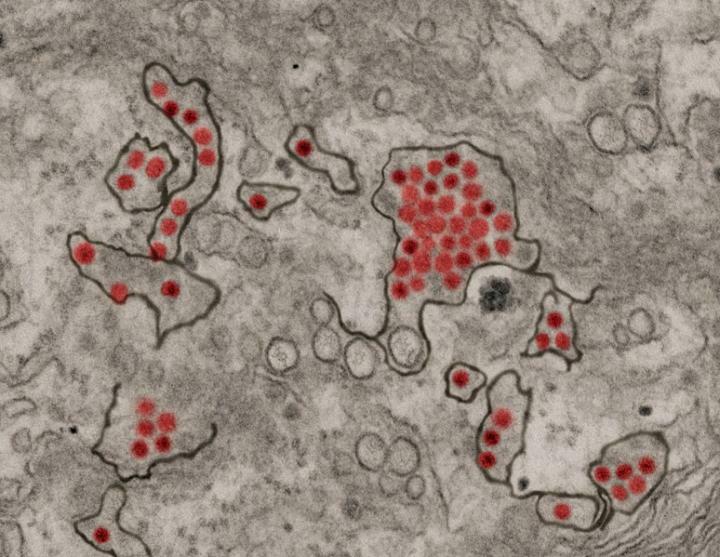 Researchers in Raught's lab, led by postdoctoral fellow Etienne Coyaud, wanted to find out how the handful of Zika proteins were able to hijack the host cell. They knew that the feat must depend on physical interactions between viral proteins and proteins native to the cell–but which ones? Because of the increasing evidence linking Zika infections in expectant mothers to microcephaly in their children, Raught said, "We thought it better to leave the actual virus work to the experts." Instead of using infectious material, the team made 10 strains of human cells — each expressing one of Zika's 10 proteins. By adding a small "epitope" tag to each viral protein (called a "Flag" tag), they were able to retrieve the viral proteins using an antibody that binds to this tag. The host proteins that stuck tightly to each viral protein came along for the ride; the researchers used a technique called mass spectrometry to identify those human proteins.